Analysis: Jones' 2018 season came to a premature close after he suffered what was initially classified as a right knee bruise during Detroit's Week 10 loss to Chicago. Since there haven't been any reports the setback required surgery, it's not a huge surprise he could be running around again in time for OTAs this spring. Jones is entering the fourth year of the five-year contract he signed with the Lions in 2016. Jones (knee) may be considered expendable after Kenny Golladay broke out for 1,063 yards in 2018, Nate Atkins of MLive.com reports. The Lions will place Jones (knee) on injured reserve, Michael Rothstein of ESPN.com reports. Jones (knee) won't play Thursday against the Bears, but he has a chance to return to action against the Rams on Dec. 2, Ian Rapoport of NFL Network reports. Analysis: Jones has been dealing with a bone bruise in his knee, but it looks like the receiver's absence may be limited to two games, with his Week 13 playing prospects bolstered by the added healing time the Lions' current short week will afford him. With Jones out Thursday, look for TJ Jones and Andy Jones, along with Bruce Ellington (assuming he plays through back issue) to see added work in the Detroit passing game behind top option Kenny Golladay. Jones (knee) has been ruled out for Thursday's game against the Bears, Tim Twentyman of the Lions' official site reports. Analysis: Jones hasn't been able to practice in any capacity the past two weeks while recovering from a bone bruise in his knee. It's an unpredictable injury that could lead to missed time beyond Week 12, though a return for Week 13 against the Rams wouldn't come as a major surprise either. Kenny Golladay is a clear favorite to lead the Lions in targets during the Thanksgiving Day game, with TJ Jones, Bruce Ellington (back) and Andy Jones all providing support. Jones (knee) was not a participant in Tuesday's practice, Dave Birkett of the Detroit Free Press reports. Analysis: After missing Sunday's contest against the Panthers, Jones doesn't seem to be moving toward playing Thursday having logged a pair of DNPs to open the week. He would likely need to show progress in practice Wednesday to have a chance of returning to the field for the Thanksgiving Day matchup with the Bears. Jones (knee) is listed as a non-participant on Monday's estimated practice report, Dave Birkett of the Detroit Free Press reports. Analysis: Given that he didn't come close to playing in Sunday's 20-19 win over Carolina, the veteran wideout doesn't seem especially likely to return for Thursday's game against the Bears. With top running back Kerryon Johnson (knee) also shaping up as a long shot, the Lions likely will be short on offensive weapons for the difficult matchup. Jones is recovering from a bone bruise in his knee and didn't practice at all last week. Jones (knee) has been ruled out for Sunday's game against the Panthers, Kyle Meinke of MLive.com reports. Jones is scheduled to receive a second opinion on the knee injury he suffered in the second half of Sunday's 34-22 loss to the Bears, Michael Rothstein of ESPN.com reports. Jones (knee) isn't present for the open portion of Friday's practice, Tim Twentyman of the Lions' official site reports. Analysis: Absent from the practice field for a third straight day, Jones doesn't seem likely to play in Sunday's game against the Panthers. Another update on Jones will come within the next few hours when the Lions release their final Week 11 injury report. Jones (knee) wasn't present for the portion of Thursday's practice that was open to the media, Tim Twentyman of the Lions' official site reports. Jones (knee) was listed as a non-participant at Wednesday's practice, Tim Twentyman of the Lions' official site reports. 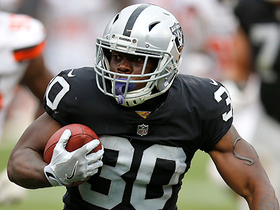 Analysis: Jones tried to return to Sunday's 34-22 loss to the Bears after suffering a bone bruise in the third quarter, but he ultimately wasn't able to play through the injury and had to sit out late in the game. While fortunate to avoid ligament damage, the 28-year-old wideout is no lock to be ready in time for the Lions' Week 11 game against the Panthers. Detroit may have little choice but to pepper Kenny Golladay with targets. Jones (knee) has been diagnosed with a bone bruise, Adam Schefter of ESPN reports. Analysis: Jones is considered day-to-day after tests showed his ACL and MCL are intact, but this is still an injury that threatens his availability for Week 11 against Carolina. He was removed late in the third quarter of Sunday's 34-22 loss to Chicago, finishing with three catches for 55 yards on seven targets. The Detroit passing game will run through Kenny Golladay if Jones misses any time, with TJ Jones, Bruce Ellington and Brandon Powell all candidates to take some of the vacated snaps. 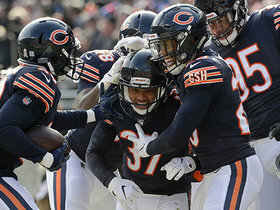 Before exiting with a knee injury late in third quarter of Sunday's 34-22 loss to the Bears, Jones brought in three of seven targets for 55 yards. Analysis: Jones generated a team-high 18.3 YPC on the afternoon before his exit. 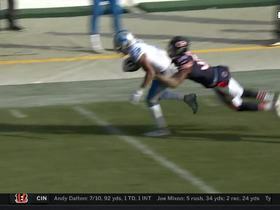 The veteran receiver suffered the injury late in the third quarter on an unsuccessful catch attempt down the sideline over Bears cornerback Kyle Fuller, and he did not return to the contest as Detroit tried to mount a comeback. Further details are likely forthcoming regarding the severity of the injury, which is of paramount concern to a Lions squad that just traded Golden Tate to the Eagles at the trade deadline. Jones (knee) is questionable to return to Sunday's game at Chicago, Dave Birkett of the Detroit Free Press reports. 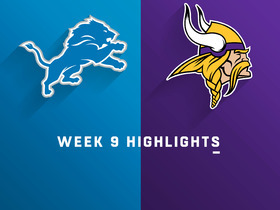 Analysis: The Lions picked up injuries to offensive stalwarts in the second half of this game -- also, running back Kerryon Johnson (ankle) -- leaving the team woefully thin at the skill positions. If Jones remains sidelined, Detroit's wideout group will be whittled down to Kenny Golladay, TJ Jones and Brandon Powell. Jones caught six of eight targets for a team-high 66 yards in Sunday's 24-9 loss to Minnesota. Analysis: Jones has topped 60 receiving yards in back-to-back weeks after exceeding that mark only once in his first six games. 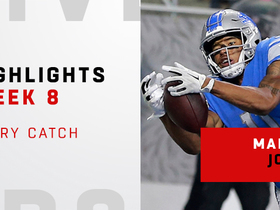 With Golden Tate now plying his trade in Philadelphia after a trade deadline deal, Jones and Kenny Golladay should both see increased roles in Detroit's passing game against the Bears in Week 10 and beyond. Jones will continue to operate as an outside receiver following the trade of Golden Tate to the Eagles, Adam Caplan of SiriusXM Radio reports. 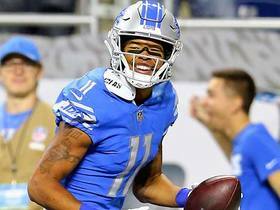 Analysis: For most of this season, Jones worked in the shadow of Tate and second-year wide receiver Kenny Golladay, surpassing 60 yards just one time during the first six games. However, Jones bounced back this past Sunday against the Seahawks, hauling in seven of 10 passes for 117 yards and two touchdowns. The trade of Tate opens up nearly 10 targets per game, ensuring more consistency for Jones and Golladay moving forward. Jones caught seven of 10 targets for 117 yards and two touchdowns during Sunday's 28-14 loss to Seattle. Jones secured three of four targets for 29 yards during Sunday's 32-21 victory over Miami. Jones secured one of four targets for an eight-yard touchdown during Sunday's 31-23 victory over the Packers. Jones (ankle) is active for Sunday's game against the Packers. Analysis: A late-week addition to the injury report with an ankle issue, Jones will ward it off and suit up versus a Green Bay defense that has allowed 7.3 YPT and six touchdowns to wide receivers through four games. With a catch rate of just 51.7 percent this season, though, he's reliant on the big play to post a respectable line. Jones (ankle), who is listed as questionable on the official injury report, is expected to play Sunday against Green Bay, Adam Schefter of ESPN reports. Analysis: Jones was a late addition to the practice report as he was a limited participant at Friday's practice. It sounds like he'll play, but double check his status before Sunday's 1 p.m. ET kickoff. Jones was a limited participant at Friday's practice due to an ankle injury and is listed as questionable for Sunday's game against the Packers. Analysis: The end-of-week addition is somewhat worrisome, suggesting Jones suffered an injury during practice either Thursday or Friday. A follow-up report on Jones' status should become available prior to Sunday's 1 p.m. ED kickoff. TJ Jones would join Kenny Golladay and Golden Tate in three-wideout formations if Jones were to end up missing the contest. Jones caught three of five passes for 56 yards during Sunday's 26-24 loss to the Cowboys. Jones caught four of six targets for 69 yards and a touchdown during Sunday's 26-10 victory over the Patriots. Jones (ankle) is listed as active Sunday against the Patriots, Tim Twentyman of the Lions' official site reports. Analysis: The Lions tacked Jones onto the final Week 3 injury report with an ankle injury, which capped his practice reps Friday. No matter, he'll be available to Matthew Stafford in this matchup with the defending AFC champions. Jones' target share and offensive snap count rank behind both Golden Tate and Kenny Golladay this season, so he seems to be losing some of his clout within the Lions' passing attack. The Lions are optimistic that Jones, who was added to the injury report Friday with an ankle issue, will be available for Sunday's game against the Patriots, sources informed Ian Rapoport of NFL Network. Analysis: Jones' ankle will be monitored carefully throughout the day, with the wideout's activity in pregame warmups likely dictating whether or not he garners active status. 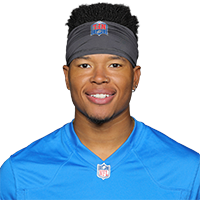 While Jones seems to be trending in the right direction, the fact that he's not a lock to suit up makes him a risky lineup choice, especially with clarity on his availability (or lack thereof) not likely to come until the Lions release their inactive list approximately 90 minutes before the 8:20 p.m. EDT kickoff. Jones (ankle) is listed as questionable for Sunday's game versus the Patriots. Jones caught four of nine targets for 54 yards and one touchdown during Sunday's 30-27 loss to the 49ers. Jones caught four of eight targets for 54 yards during Monday's 48-17 loss to the Jets. Jones caught one of two targets for 12 yards in Friday's preseason game against Tampa Bay. 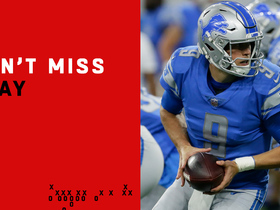 Analysis: Though he didn't have much impact statistically, Jones stayed on the field for nearly every snap until Matthew Stafford was pulled from the game. The 28-year-old likely will be held out of Detroit's final exhibition contest, finishing the preseason with three catches for 26 yards on seven targets. Jones should pick up some steam in a Week 1 home game against the Jets. Jones corralled two of five targets for 14 yards during Friday's preseason game against the Giants. Jones (leg) returned to practice Sunday, Dave Birkett of the Detroit Free Press reports. Analysis: Jones left Saturday's practice with some sort of injury to his left leg. According to Tim Twentyman of the Lions' official site, the receiver returned Sunday in full pads, suggesting he didn't experience anything severe. Jones will try to continue his impressive start to training camp, where Kyle Meinke of MLive Media Group indicated that Jones has been unguardable early on. Jones appeared to sustain an injury to his left leg during Saturday's practice, Tim Twentyman of the Lions' official site reports. Analysis: Jones banged his left knee following a stellar catch in practice. The Lions will likely take a cautious approach given Jones' value to the offense. If the veteran wideout is forced to miss just a few practices it shouldn't affect his status for a Week 1 contest against the Jets. Jones led the league with 467 receiving yards and 25.9 yards per catch on contested targets last season, according to Pro Football Focus. Jones, who trained with former NFL receiver Randy Moss in North Carolina last offseason, plans to do so again in 2018, Kyle Meinke of MLive.com reports. Jones caught four of five targets for 81 yards and a touchdown during Sunday's 35-11 victory over Green Bay. 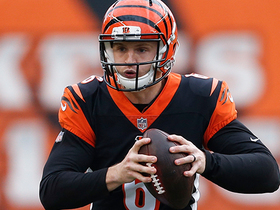 Jones caught three of five targets for 50 yards during Sunday's 26-17 loss to the Bengals. Jones caught three of five targets for 85 yards during Saturday's 20-10 victory over the Bears. Jones brought in three of four passes for 64 yards in Sunday's 24-21 win over the Buccaneers. Analysis: Jones played a complementary role alongside Eric Ebron and Golden Tate, who combined for 18 catches on 20 targets. However, he did make one of his trademark downfield contributions, hauling in a 38-yard throw from Matthew Stafford (hand) in the first half. Jones has seen his yardage totals drop after each of the last two games, but he's now just 115 yards away from his first 1,000-yard season. He'll look to keep building toward that goal against the Bears in Week 15. Jones caught four of eight receptions for 90 yards during Sunday's 44-20 loss to the Ravens. Jones caught six passes on nine targets for 109 yards and two touchdowns during Sunday's 30-23 loss to the Vikings. Jones grabbed four of seven targets for 85 yards and a touchdown during Sunday's 27-24 win over the Bears. Analysis: Jones burned Chicago deep in the second half, laying out for a 28-yard touchdown as part of Detroit's 21-point second-quarter explosion. It was Jones' fourth touchdown in his last five games. During that streak, he's also topped 85 yards in four games. The red-hot target comes up against a stiff test next week against a Vikings squad that held him to two catches in Week 4. Jones caught one of two targets for 22 yards during Sunday's 38-24 victory over the Browns. Jones caught seven of 11 targets for 107 yards and two touchdowns in Monday night's 30-17 win over the Packers. Analysis: Jones hauled in a 25-yard touchdown on Detroit's opening offensive drive, then caught an 11-yard score to put the game away in the fourth quarter. In doing so, Jones once again found pay dirt twice in Green Bay, where he ripped off 205 yards and two touchdowns in his visit last season. Averaging over six catches and 110 yards over his past three games, Jones will look to keep it rolling in a favorable Week 10 matchup versus the Browns. Detroit Lions wide receiver Marvin Jones makes a leaping grab for 32 yards. Chicago Bears cornerback Bryce Callahan intercepts Detroit Lions quarterback Matthew Stafford's pass. 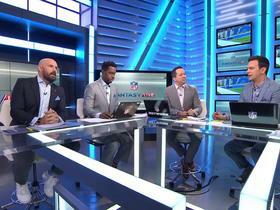 The "NFL Fantasy Live" crew discuss which fantasy players are most likely to ball out in Week 9. 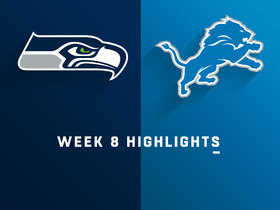 Watch every Detroit Lions wide receiver Marvin Jones catch in Week 8 vs. the Seattle Seahawks including two touchdowns. Detroit Lions quarterback Matthew Stafford evades Seattle Seahawks pressure to launch a 39-yard touchdown pass to wide receiver Marvin Jones. Detroit Lions quarterback launches the ball 19 yards to wide receiver Marvin Jones who drags his foot to stay in the end zone for a touchdown.